Tim McInerney is having a week on and off the track that he'll never forget. On Tuesday, the senior at Christian Brothers Academy announced that he committed to Georgetown University. Then on Wednesday, he blasted a US #2 4:16.01 to win the mile at the Millrose Games Trials at the 168th Street Armory in New York. McInerney, who closed in 60 point, finished just ahead of runner-up Will Baginski of Ridgewood, who placed second with a PR and US#3 of 4:16.87. With his victory, McInerney, who also visited Villanova and Texas, automatically qualified him for a spot on the line in the boys high school mile at the 112th Millrose Games on Feb. 9 at the 168th Street Armory. 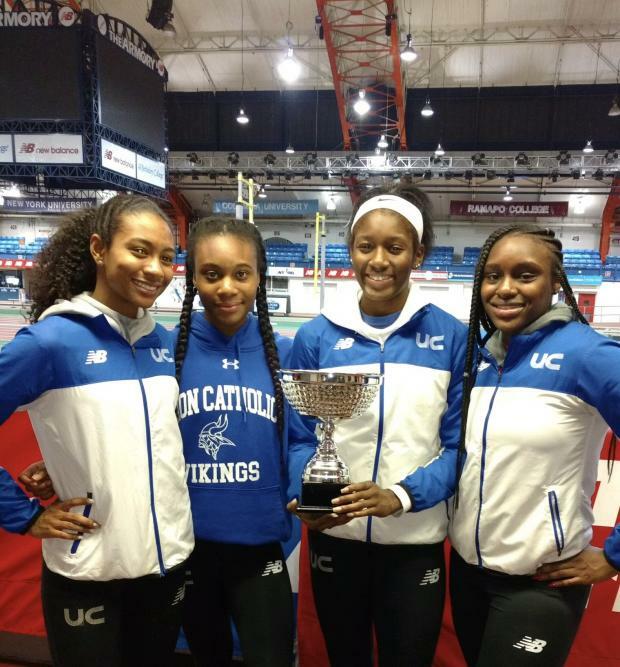 Also punching tickets into the Millrose Games were the Union Catholic girls, who blazed a US #1 and NJ# 12 all-time 3:50.93 to win the Suburban Division, the St. Benedict's Prep boys 4x400, who won the Suburban Division in a NJ#1/US#4 3:21.18, Teaneck freshman Kayce Darby, who won the girls 55 dash in 7.22, the East Orange boys 4x400, and the Millville girls 4x400. Other NJ winners were the Ridgewood girls 4x800 in a NJ #3 9:43.40, and Conor Reilly of Union Catholic in the boys pole vault (14-2). Winners of the 4x800 and pole vault don't receive automatic berths into the Millrose Games. Those events are invitation only. 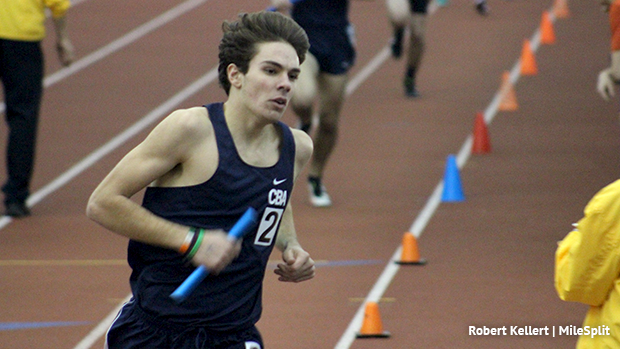 McInerney's 4:16.01, an indoor PR, adds to his remarkable resume at CBA. Last spring, he ran a PR of 4:10.37 to place second in the 1,600 at the Meet of Champions, ran a PR of 9:20.91 in the 3,200, and won the 800 (PR of 1:54.17) and 1,600 and ran on the winning 4x800 to held lead CBA to the Non-Public A state title. This past fall, McInerney placed sixth at both the XC Meet of Champions and the Nike Northeast Regional to help CBA win those titles. In the girls 4x400, Union Catholic splits were 58.29 for Khamil Evans, 57.51 for Sydney Tucker, 57.26 for Chi Chi Nkulume, and 57.86 for Leena Morant. The 4x400 splits for the St. Benedict's were 50.65 for Lewis Ngwenya, 50.15 for Jackson Burnett, 50.27 for Isaiah Sanchez, and 50.09 for Alfred Chawanza. The East Orange boys ran 3:26.30, the third fastest time in the Suburban Division, to secure a Millrose berth for the fifth straight year. The Millville girls ran the fourth fastest time in the Suburban Division of 4:02.48 to earn a Millrose berth.